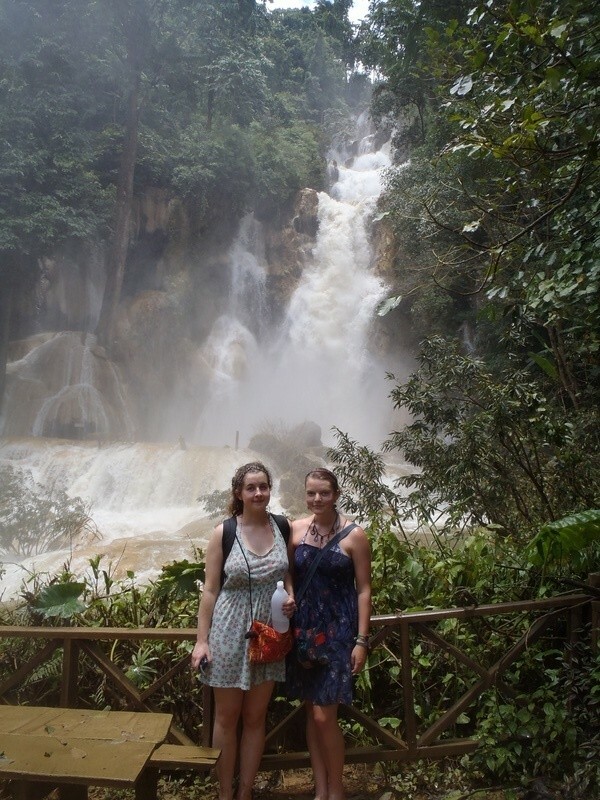 After another 5am start, my friend Ailsa and I caught a local bus through Northern Thailand from Chaing Rai over to the Laos border. 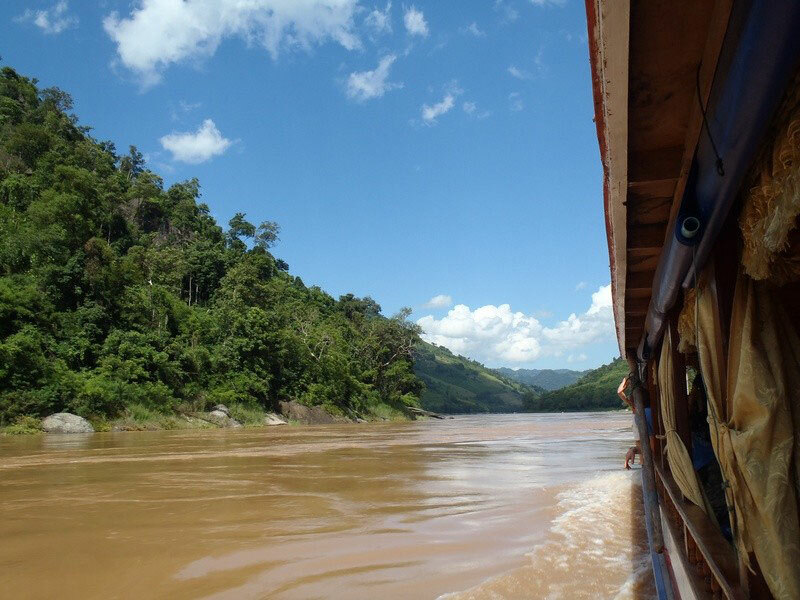 Disregarding the ominous weather reports (from that kind of doomsday traveller who warns you against visiting somewhere he's raving about- just in case you can't handle it) we were determined and crossed the enormous Mekong river, no-man's land between nations, in a tiny longtail boat. Thankfully it was a simple border crossing, even if (being British) we did have to pay an extra $5 for our visas. Newly stamped and wary of our safety in the fast boats, we found a more substantial slow boat to take us downstream. 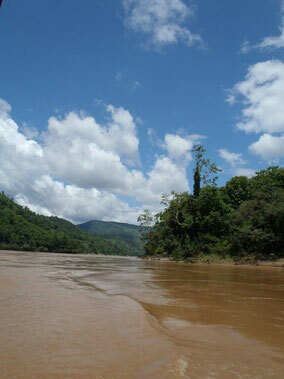 The journey took two long days with a stop in the tiny riverside town of Pak Beng. It was sweaty and a little cramped, but for me the most memorable part of our time in South East Asia. Slow boats at the border. 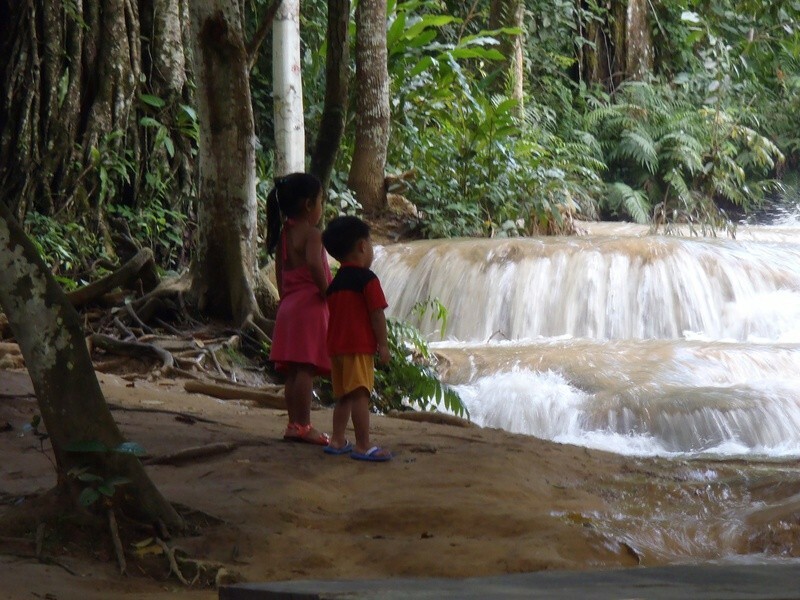 From the river, the forest looks uninhabitable, dense trees and steep mountains, but we spotted children playing in the water and men fishing every now and again. 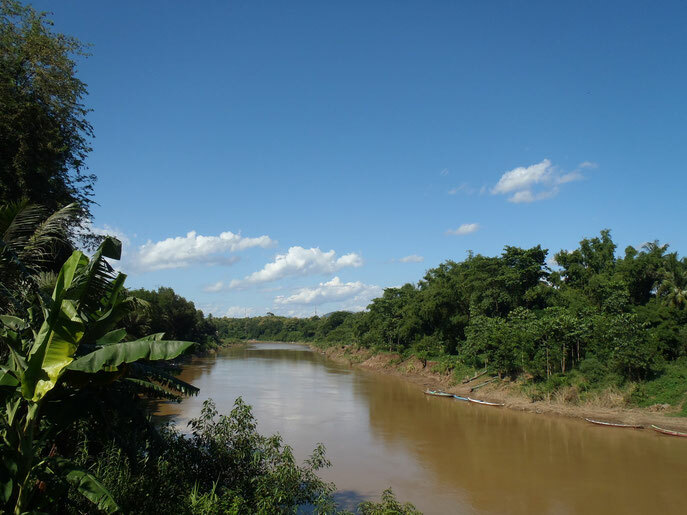 People live sporadically along the banks, but there's no big settlements on this stretch of the Mekong. Twice we saw a bloated dead pig bobbing along on it's back- grotesquely caught in a whirlpool the second time, it was probably one and the same. 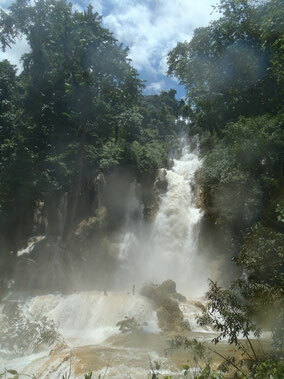 This is not a mode of travel for the impatient, but I think that applies to everything in Laos. It's not a country to explore in a hurry and those trying to rush will probably find local attitudes to time-keeping frustrating. 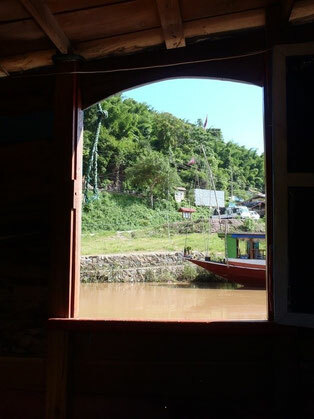 Laos time suits me pretty well and I enjoyed the downtime, writing, reading and watching the river pass by. Don't sit near the engine! It's impossibly loud, hot and probably very bad for your lungs. Sometimes the people working on the boats try to overfill them. There's little you can/should do about it alone, but locals are annoyed too. We were involved in a mini revolution when they tried to make us sit on the floor on day two (eventually another boat materialised to take half the passengers). 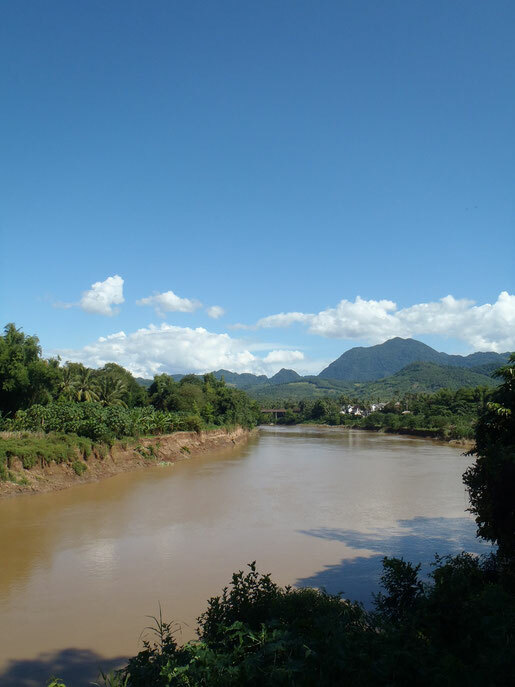 The view over a smaller river from Luang Prabang. After such a beautiful journey we needed an inspiring destination. 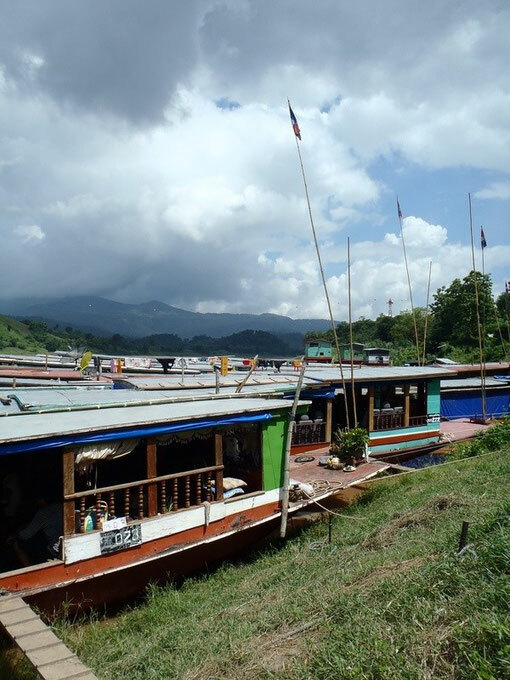 Although I was sad to leave the boat, Luang Prabang's laid back atmosphere, dirt cheap Beer Lao and extensive markets provided an interesting diversion. It's getting a bit touristy, but being less accessible than many popular places in Thailand, this side of the town hasn't entirely taken over yet. The small city became important from the mid 1300s as the capital of the first Lao kingdom- Lan Xang (land of the million elephants). 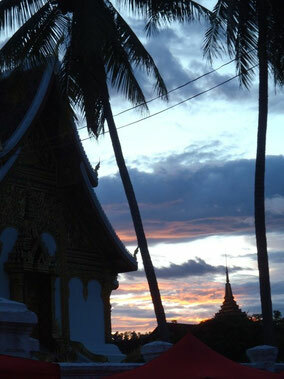 After a couple of hundred years the kingdom fragmented, Luang Prabang became weak and ultimately the 1887 sacking of the city by the Chinese led the existing monarchy to accept the protection of the French. You'll see this layer of history in the faded fancy colonial villas dotted between traditional buildings as you explore. With the final withdrawal of the French and 1975 revolution bringing an end to the old monarchy, the city once again fell into obscurity and through poverty, saved itself from further development. 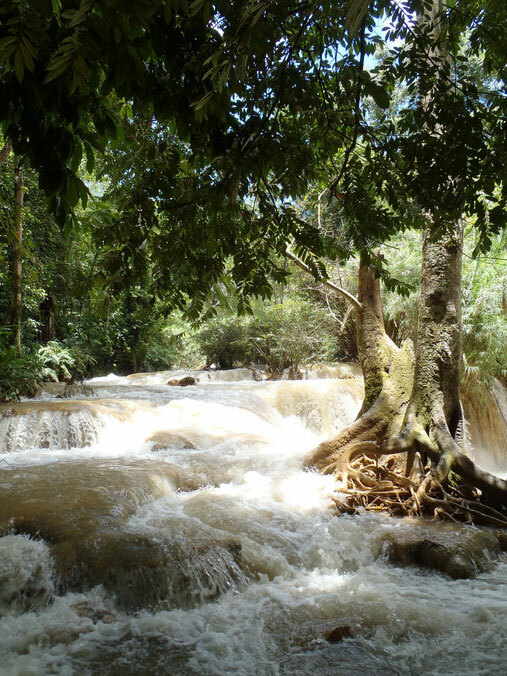 It's worth making your way outside the city to visit Kouang Si. As regulars to this site will know, I've often found visiting waterfalls to be a bit of an anticlimax. This one is truly impressive. 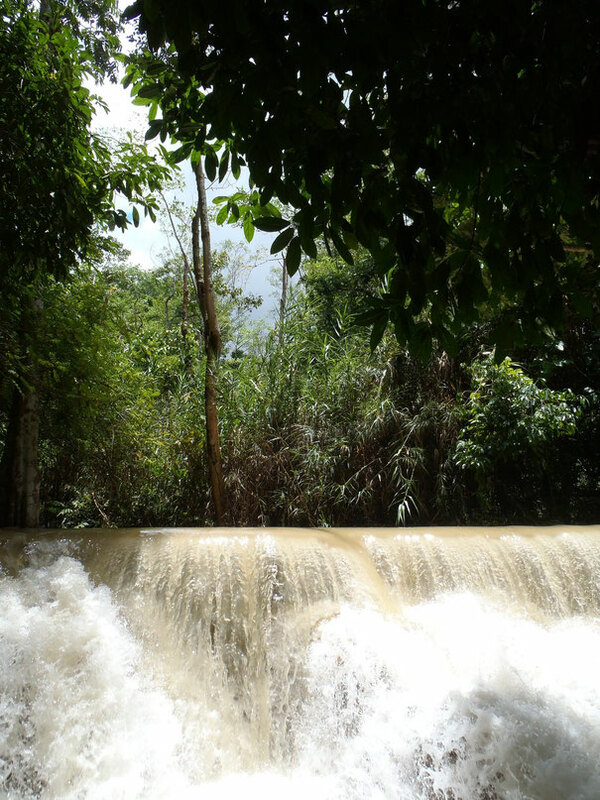 The camera angle can't do it justice, but the torrent tumbled down from such a height that the spray made us drenched before we even got in the water. It's supposed to be crystal clear at other times, but in July- the rainy season, you can see that the water was muddy with its sheer volume smashing over the rocks. Regardless, we tentatively went for a swim in one of the pools underneath. 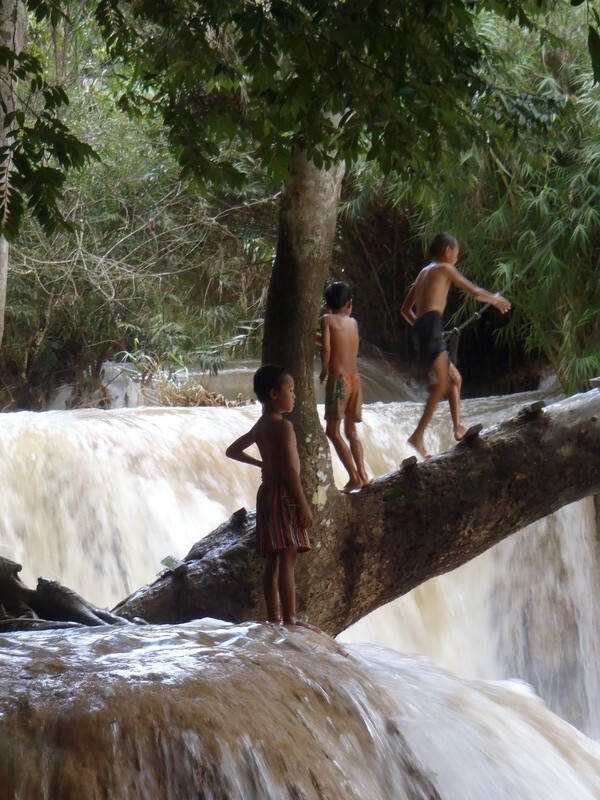 I'd personally be careful to avoid the strongest currents, although the local children seem to be totally fearless. 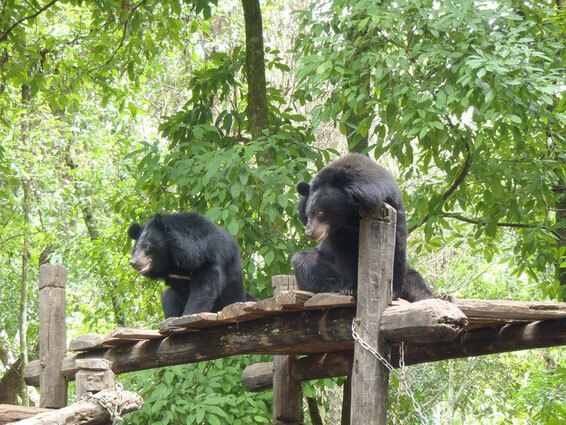 In the same area, though not receiving any of the park entrance fees, there is a little sanctuary for sun bears. I've often been disturbed by what can qualify as a "rescue centre" in places where there is a potential to use the animals as bait for tourist money, but from further research and the animals' condition, this Free the Bears project seems to be a good cause. 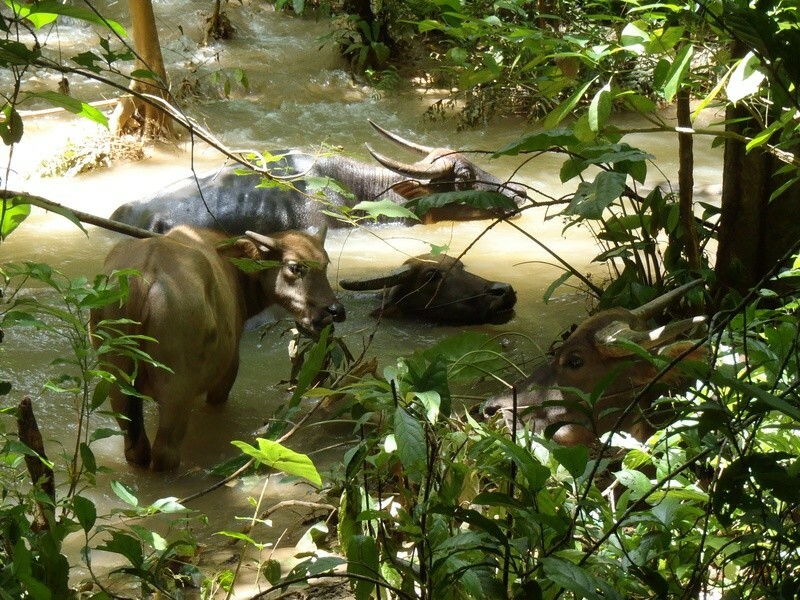 These cuddly looking animals are rescued from poaching and in my very un-scientific opinion, seemed to be enjoying lolloping around their relatively spacious man-made playground. 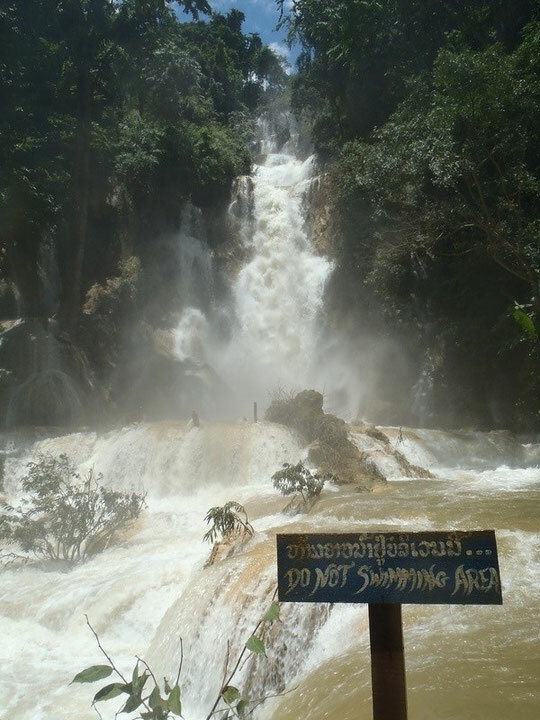 My time in Laos was several years ago now, so I'd worry that prices and accommodation recommendations might be inaccurate. The weather on the other hand is information you should be aware of. The dry season is October to late April. Unfortunately this time of year can make river travel more difficult partly due to damming and diversions in China. 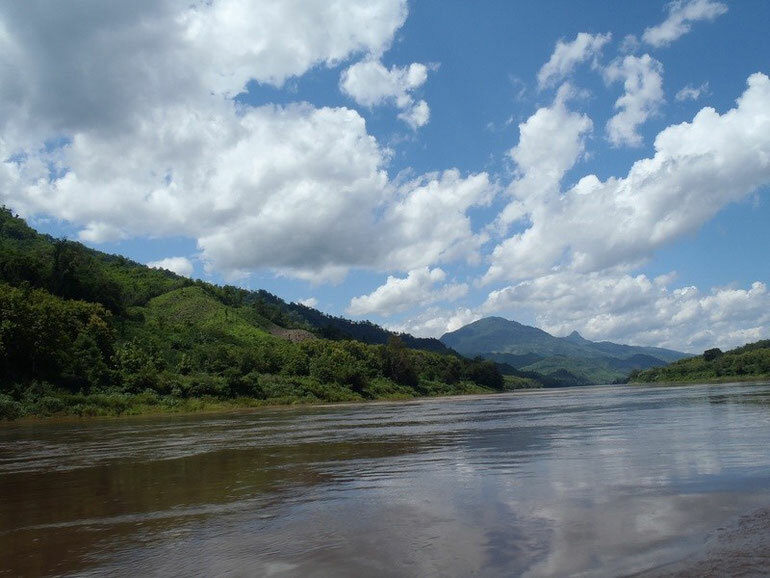 The low water in the Mekong is also badly affecting the environment in Laos as a lack of fish disrupts the food chain and endangers larger animals. The wet season (May to late September) can make land travel a bit more tricky with more landslides. 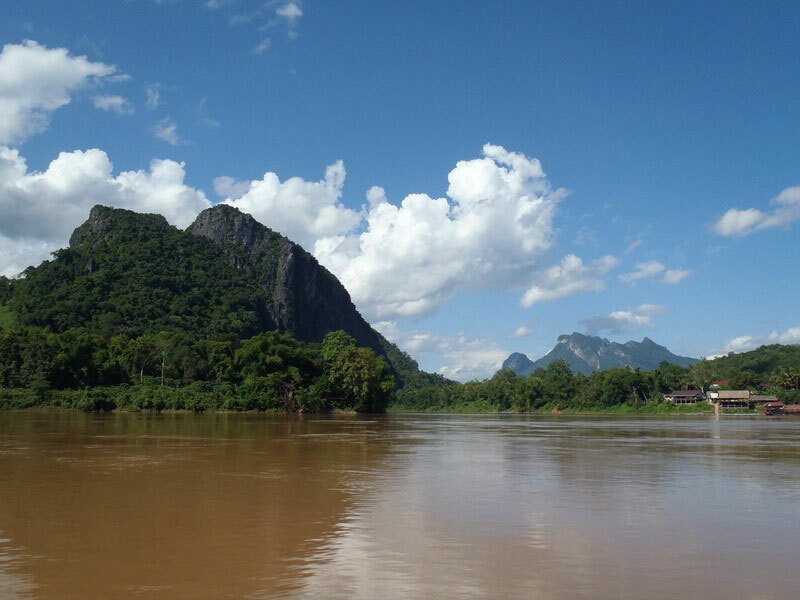 May and June are usually being the hottest of the year so you'll be particularly sticky around the lowest altitudes on the Mekong. The Forest of Dean and canoeing along the river Wye border between England and Wales. 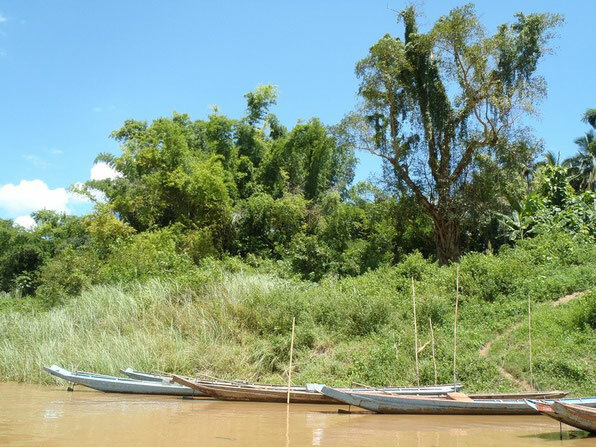 Friday Fix: a sobering walk down the river in Siem Reap, Cambodia. Lake Titicaca: Copacabana and the Isla del Sol, Bolivia. Coiroco, tropical gardens of the Yungas, Bolivia. Mindo: hummingbirds and butterflies, but not really a waterfall, Ecuador.